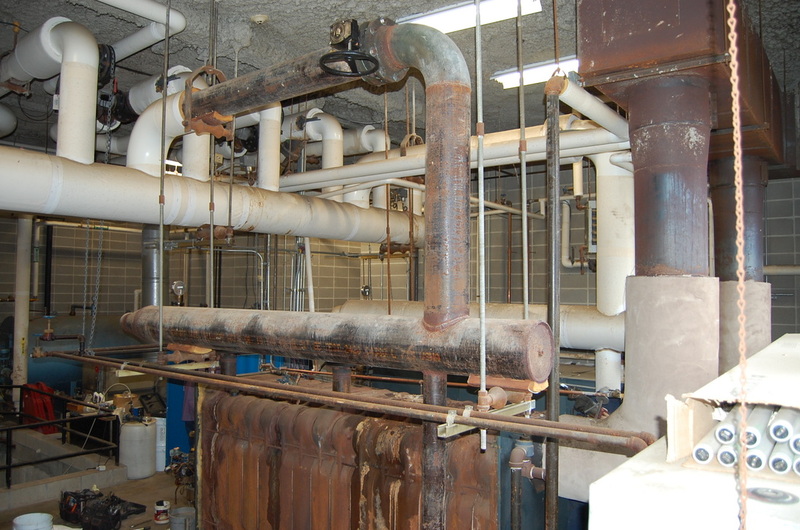 Dealing with cast iron boilers and leaking sections? 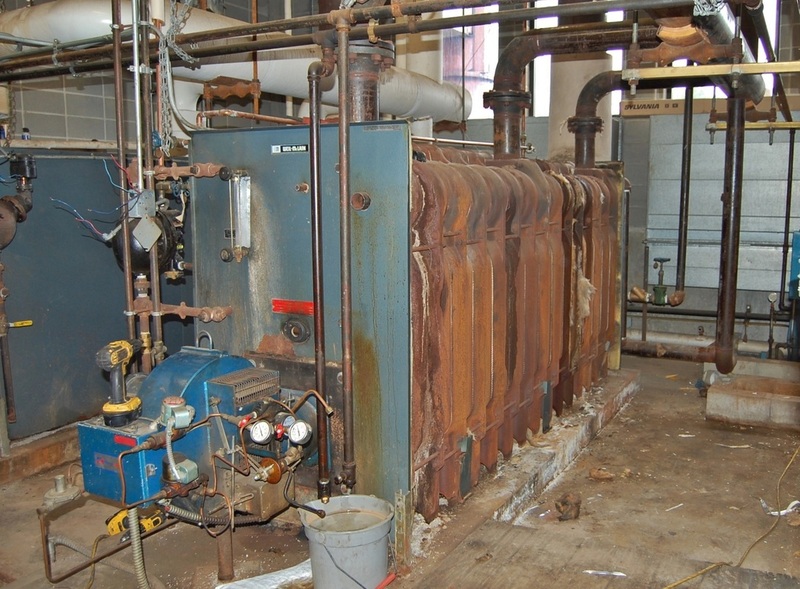 Scope: Replace the existing leaking #2 cast iron boiler with a new high efficiency Hurst steel firetube boiler packaged with a dual fuel S.T. Johnson burner firing #2 oil and gas. 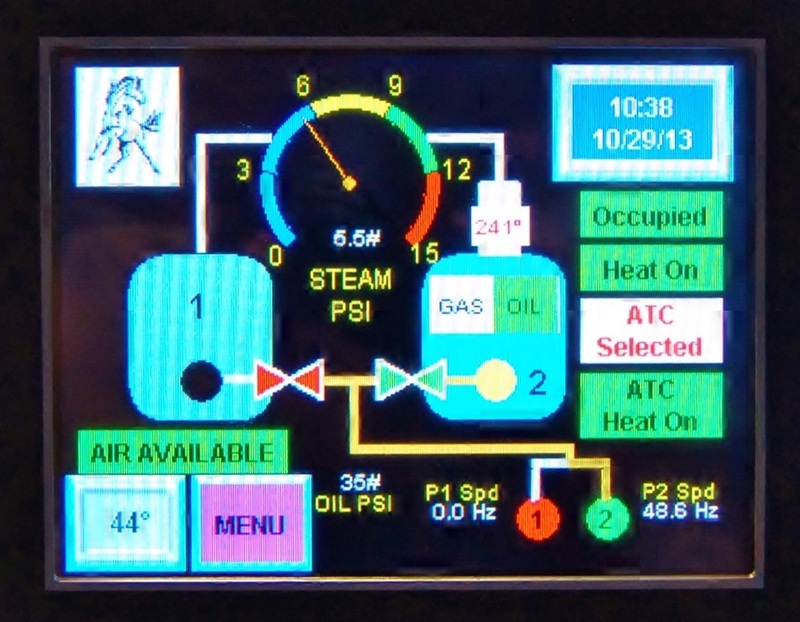 Goal: To provide equipment that increases operating efficiency & reliability and offers ease of ongoing maintenance. Awarded as a turnkey installation: IBS manages all phases of the project - from demolition to start-up and commissioning. Demolition done neatly and systematically every time. Domestic material expertly fitted and hung, all painted or crisply covered for that fine white finished look. 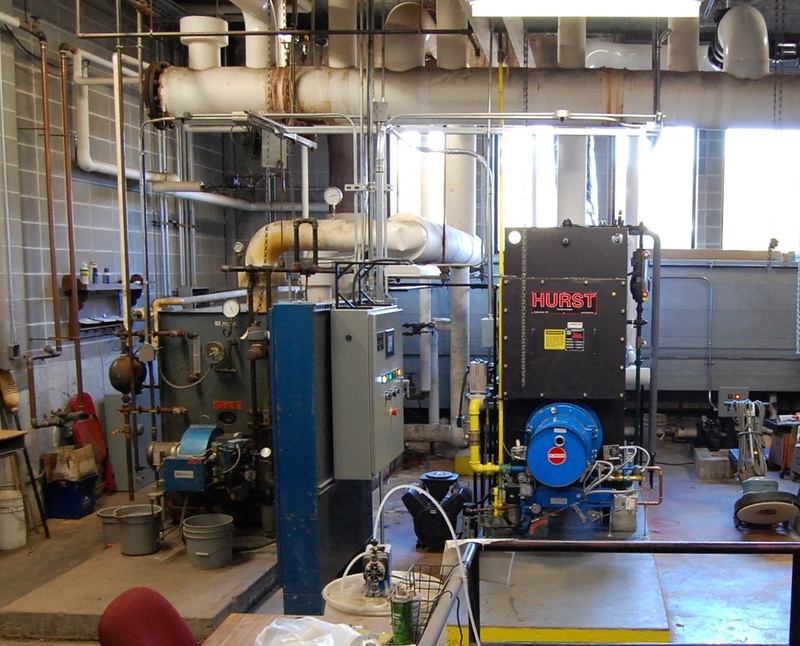 Above you see one header taken out and the other utilized as is, a 6" gate valve operable from the floor, and green blowdown lines running parallel with the floor. 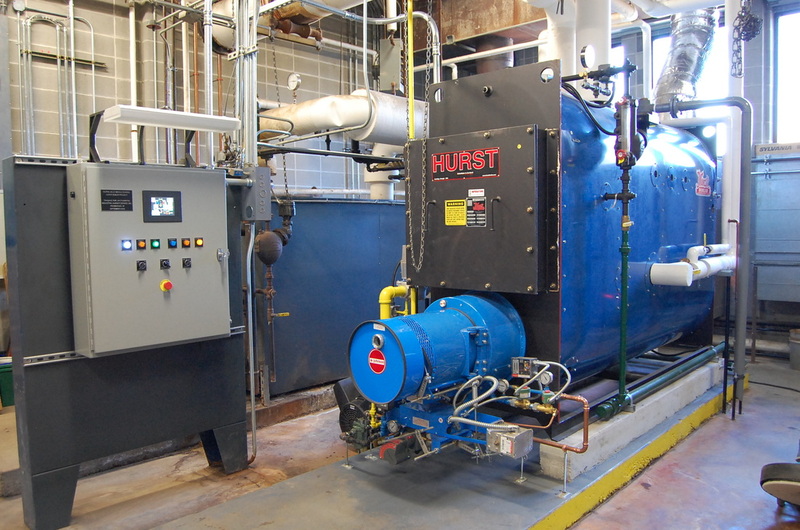 New Boiler: The Hurst Model LPE100 is a three-pass modified scotch, steel firetube boiler constructed for 15 PSI steam. 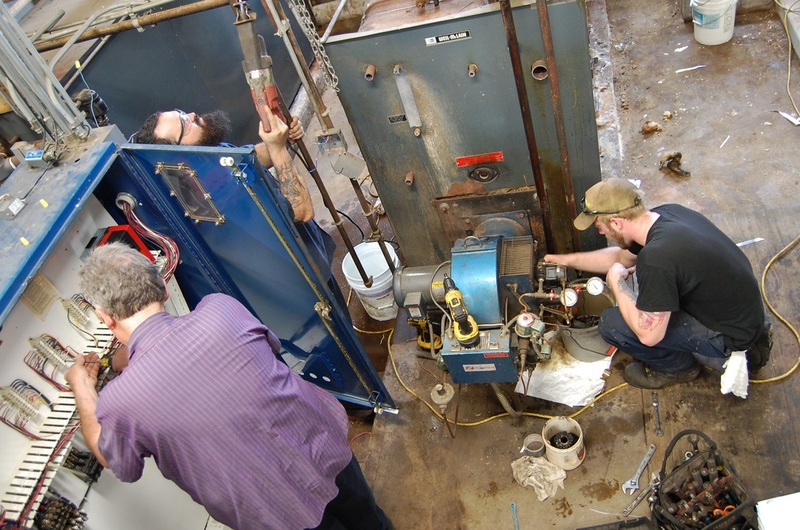 If a tube ever needs to be replaced, the tube sheet is so thick it doesn't require expensive certified welding. 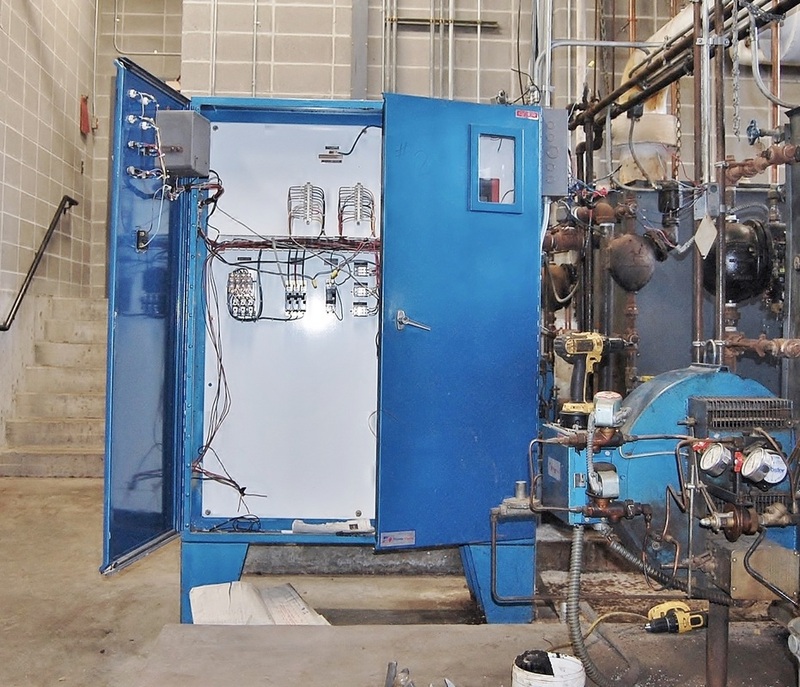 The LPE boiler has virtually no refractory, just a burner "dry oven", eliminating costly refractory maintenance. Burner: The S.T. 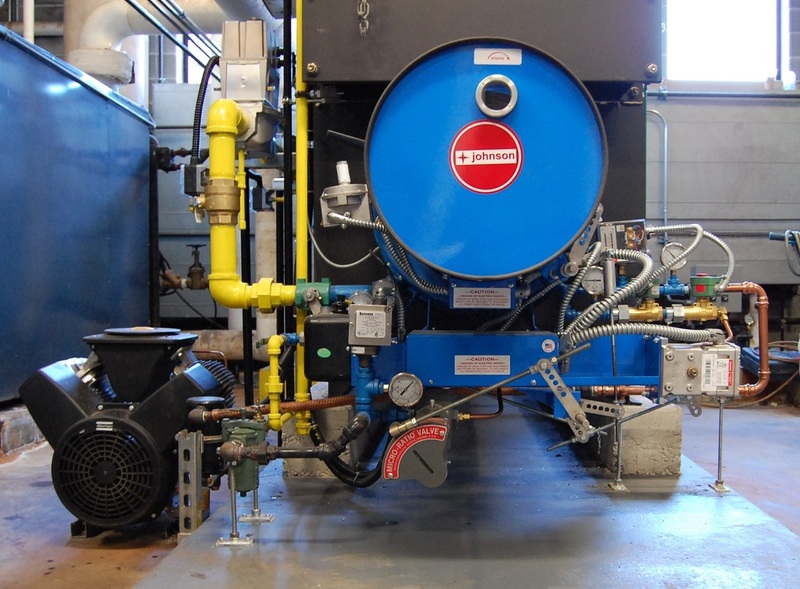 Johnson Model FD68CA125LM is a forced draft axial flow burner, firing both natural gas and air atomizing #2 oil. 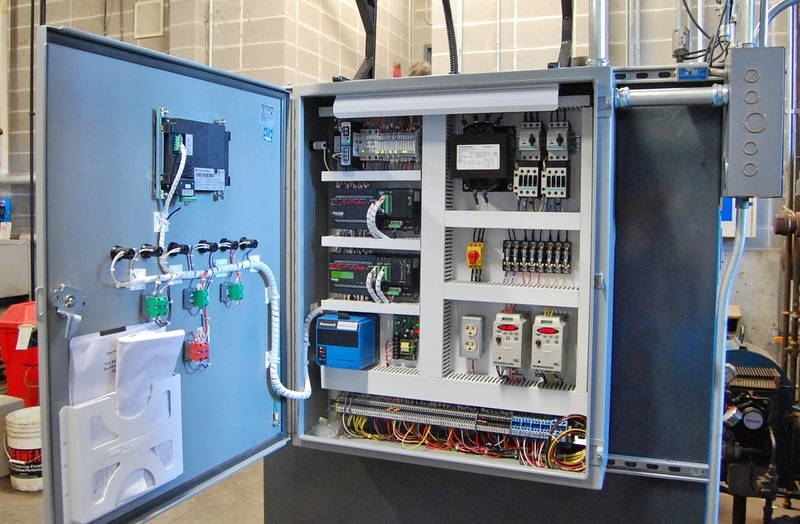 Johnson's design features heavy duty construction for superior performance, quiet operation, and ease of service. 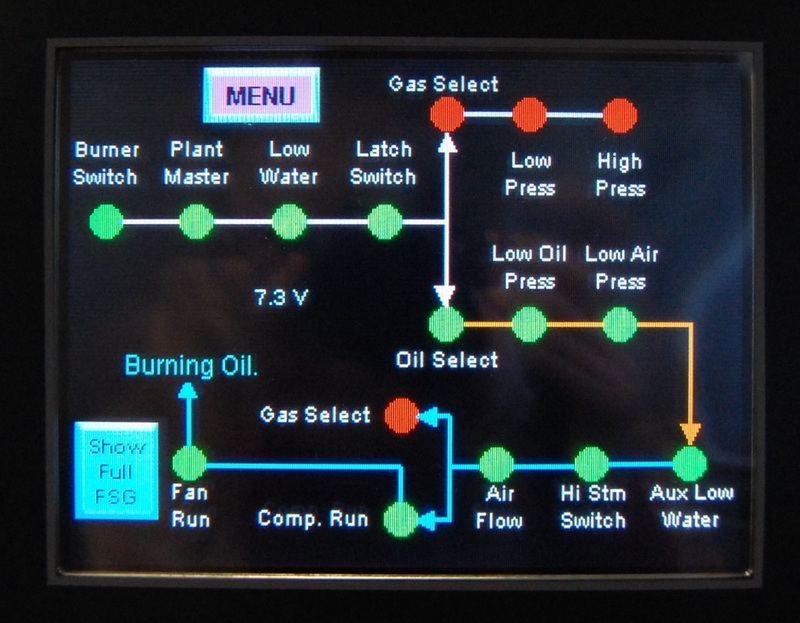 Custom oil pump set equipped with VFDs for each pump motor. 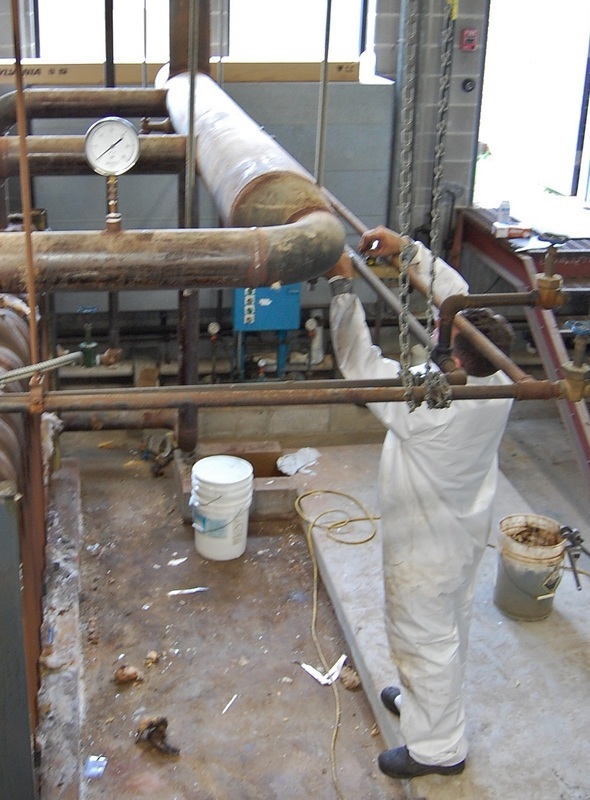 The VFDs operate in conjunction with a pressure transmitter located in the supply line to a characterized burner oil metering valve (see Johnson burner photo above). 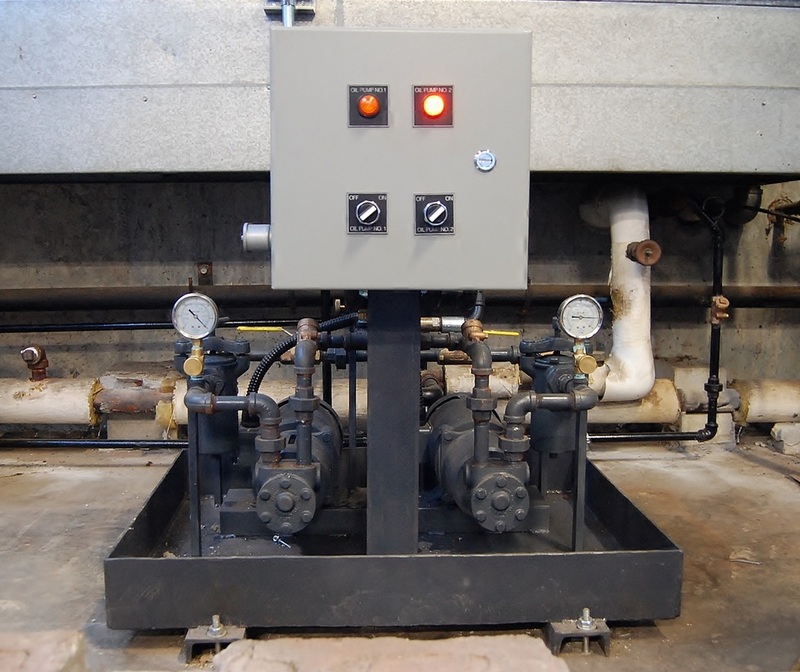 This method of fuel oil control completely eliminates the need for oil pressure regulating valves and provides a precise and constant oil pressure to the oil metering valve, regardless of firing rate. 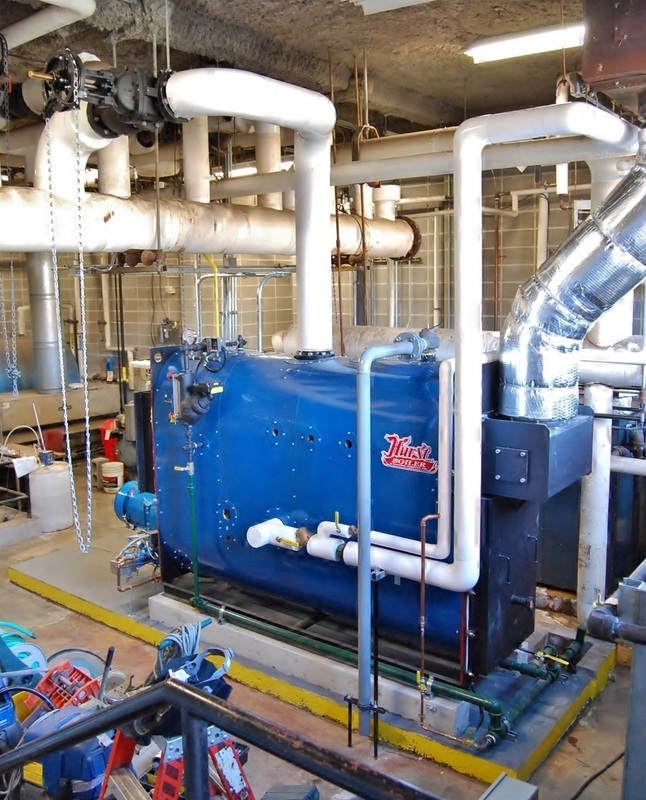 Boiler room upon completion of the project.